Salmon season has been productive on the north shore of Lake Ontario. Trollers chasing Chinook, coho and steelhead in the depths been hooking good numbers of fish, and those big Chinook are averaging more than 20 pounds. I’ve noticed a healthy population of baitfish. This is a good sign of a healthy fishery and a great sign for future runs. 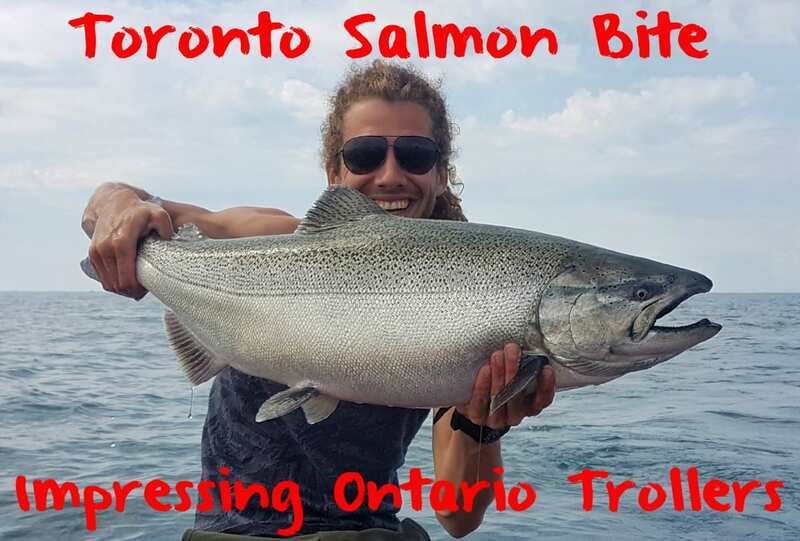 You don’t have to be the most experienced angler to catch salmon and steelhead offshore in Lake Ontario. Once you have the means to fish offshore and the proper gear it’s an easy and relaxing style of fishing. To get started with downrigging I recommend having two downrigger and two dipsy diver combos. Salmon and steelhead can be located from 100-300 feet of water in the summer depending on water temperatures. 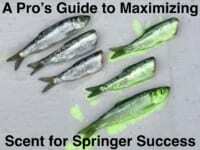 Having the right equipment to bring your presentation down to these fish is crucial to success. Spoons, Spin Doctor/Pro Troll flashers paired with a fly, and flashers paired with cut bait are the most common salmon and steelhead baits for trolling the Great Lakes. However, when the bite gets tough and slow near midday, running cut bait behind a big flasher board has been the most productive presentation for me. I brine and dye my cut bait with Natural, Blue and Chartreuse Fire Brine and Fire Dye. FireBrine toughens the bait and gives it more bling in the water, especially when you match your flasher board and teaser head colours with the coloured cut bait. 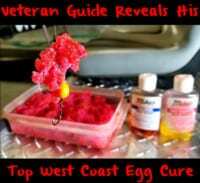 If you do have your own cut bait brining recipe, don’t be afraid to give Fire Dye a shot. All you have to do is simply quirt a generous amount of Fire Dye into a Ziploc with your cut bait and let it soak for about an hour. Fire Dye works so quickly it amazes me every time. It dyes your bait in minutes allowing you to react to hot colours the fish are keying in on. I have been trolling chartreuse and natural herring strips behind big flasher boards at roughly 2-2.5mph. When fishing cut bait behind big flasher boards, you do not want to go any faster then 2.5-mph. If you do the bait rolls too aggressively. The key to making sure your cutbait is rolling well behind your board is to always give it a test before you send your presentation down to where the fish are. I bury my rod tip into the water boat side to let the flasher board dive down so I can see how well the cut bait is rolling behind it. Ideally, you want the cut bait to roll at a moderate speed with a slight hook-like action in the roll. If you don’t test it before you send it you may be missing a lot of potential hookups. The north shore of Lake Ontario should fish well throughout the next couple of months. It has been a relatively mild summer and the rivers have been very high just about everywhere, which will be beneficial for our salmon and steelhead fishery over the course of the next few years. The action in and out of the GTA has been great off Port Credit, Bronte, Ashbridges Bay, the Islands, Bluffers, Hamilton and off all the ports from Whitby to Kingston. Please remember to check the weather conditions before heading out into our Great Lakes regardless of the size of your boat. Play it safe out there and keep em’ bent! Editor’s Note: A resident of the GTA, Bojangles has decided his adult life to fishing. To follow his angling adventures please follow him at @angle_with_bojangles on Instagram.